After breakfast, you will proceed for a half-day conducted tour of the city. Your first halt will be at the fabulous King’s Palace and then on to the National Monument. You will be taken around the Lake Gardens, National Mosque and the main Railway Station. There will be a stop-over at Merdeka or Independence Square, and a walk to Jamek Mosque, which stands at the confluence of two rivers where KL began as a little mining town. 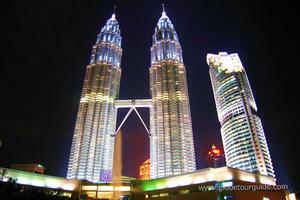 The drive will also take you past the famous Petronas Twin Towers, the world’s tallest buildings. The rest of the day will be at your disposal. Overnight at hotel in KL. Following breakfast, you will be checking out of your hotel in KL and get transferred to Cameron Highlands by coach. From 1300-m, the hill resort of Cameron stands at its highest point of 1829-m above the sea. It has neat tea plantations sprawling across this premier hill resort, colourful terraced flower gardens, orchards, vegetable gardens and strawberry farms. It is the perfect, cool weekend getaway for Malaysians seeking refuge from the frantic rush of city life. Blessed with all-year round salubrious weather, it abounds with lush flora, restful and serene atmosphere. The climb up winding roads through pristine rainforests begins at the turn-off at Tapah, the little town nestled at the foot of the hill range. There will be a brief halt at the Lata Iskandar waterfall, a popular picnic spot that has shops selling ethnic souvenirs and handicrafts, after which the drive will be resumed till you reach your hotel. The rest of the day is yours to spend as you wish. Overnight at hotel in Cameron. After breakfast, you will be guided on a half-day tour to a nearby Orang Asli village of the Semai tribe in the interiors. You will be driven downhill in a four-wheel vehicle along a dirt road towards the end of the drive. On reaching their village, you will have a first-hand encounter with the Semais, and obtain an insight into their way of life, their superstitions, skilled handicrafts, and transitional medicinal herbs. You will also witness (and later you may try your hand at) a blow pipe demonstration. You will also have the opportunity to see a variety of the carnivorous pitcher plants unique to this area. A short trek to a nearby waterfall for tea and coffee, brewed by our intrepid guides, will complete the tour. Overnight at hotel in Cameron. Following breakfast, you will be taken for a half-day countryside tour, visiting major attractions such as: Boh Sungai Palas Tea estate, vegetable farms, Rose farm, Butterfly farm, and a Buddhist temple – Sam Poh Wan Futt Chi. After returning to your hotel, you will be checking-out from Cameron, and be transferred to the KL International Airport to catch the flight back to Delhi.